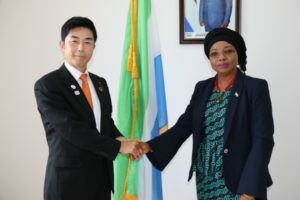 The State Minister of Health, Labour and Welfare of Japan, Hideki Makihara, and his delegation of Special Envoy has paid a courtesy call on the Deputy Minister of Foreign Affairs and International Cooperation, Mrs. Nimatulai Bah-Chang at her Tower Hill office in Freetown. According to Hideki Makihara, his visit was to deliberate on international global issues and to further strengthen the existing bilateral relationship between both countries, and to broaden Japan’s continued support to the Republic of Sierra Leone, especially the priority areas of President Julius Maada Bio’s New Direction Agenda, namely Education, Health, Energy, Water Supply and Agriculture among others. The minister revealed that a Japanese company was interested in investing in a pineapple plantation project slated to commence by 2020. He informed Mrs. Bah-Chang that they are looking forward to Dr. Alie Kabba’s participation in the Tokyo International Conference on African Development (TICAD) Ministerial Meeting in Japan scheduled for October this year as a preparatory meeting for the Summit of Heads of State in August 2019. Mrs. Bah-Chang welcomed the Minister and Special Envoys and said that Sierra Leone cherishes the relationship very well and also thanked the Japanese Government for the support they have been rendering to the country, especially during the Ebola outbreak and mudslide disaster, in addition to support in the health and agriculture sectors. She highlighted some of the key priorities of the New Direction which the government is poised to deliver. She assured the Japanese State Minister of her ministry’s cooperation with Japan in enhancing the 5 Pillars of the New Direction policies. Meanwhile, the Japanese delegation also paid a courtesy call on Vice President Dr Mohamed Juldeh Jalloh, who welcomed and appreciated their visit to the country. He also said that their visit was a stepping stone to further deepen ther existing bilateral relationship between Japan and Sierra Leone. The delegation also visited the Ministry of Tourism and the Princess Christian Maternity Hospital (PCMH). Present at the ceremony were the Deputy Director General Al-Hassan Kondeh; Director of Middle East & Asia, Mr. Winston T. Yankuba; and a cross-section of directors of other divisions; the Japanese Ambassador Extraordinary and Plenipotentiary to the Republic of Sierra Leone, HE Tsutomu Himeno and his delegation.